I am searching for a 24x48 smoker/grill made with 1/4 inch steel. I am having a hard time finding a manufacturer in the Dallas area because i want to see and touch. What are you thoughts on a really good smoker/grill. I have a budget running roughly $2500. Not many builders in DFW. Take a look at El Rey in Mansfield. 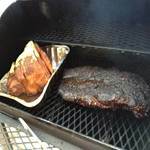 If you are willing to take a scouting trip I’d suggest Johnson Custom Smokers in Ennis and Lone Star Grillz in Willis. I would recommend a separate smoker and grill. Just my personal preference. What Sooner just said - tru' dat! !